The Drought's , Dyas, and D'Alton family all together again. Cross Made and erected by myself Alan Long. A great Woman, with a great Mind. Died in Glascow. But Returned to his place of Birth. Dublin Ireland. No Headstone just the plot, marked with a stone cross. Patrick & Elizabeth, and some of the children. Aubrey De Vere Hunt, in family plot. Emily De Vere Hunt. Nee Foott. James & Sheila and some Grand children. Plot: Found and Marked by Mr Luke Gahan. Margaret and Robert final resting place. Robert and Margaret final resting place. William A Higginbotham, and Eveline Higginbotham, final resating place. Grave 9. Section. A262. Pertuity; 9941. 24 John Alldritt.The Family Plot. 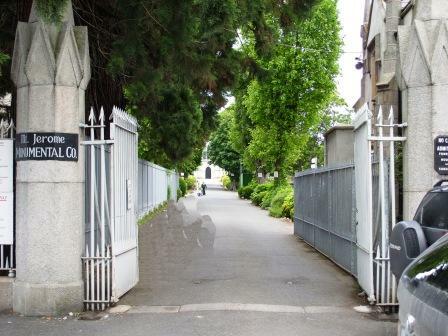 Mount Jerome. Grave: 16. Section: A333. Grant: 5554. And Grant 15454. This is a "Double Grave" Plot. Also in this Grave are Helen Alldritt, Died 1919. Rebekah Alldritt Died 1927, A sister of John Alldritt. and Eveline Florance Died 1932. 26 Robert & Eliza Drought. No Headstone, Cross Made and erected by Alan Long. Ref: No. 89. Section: A222. Grant 8295. His remaines were Buried with his son.